Lots of handy printable tools to help organize your family's school life. Homework checklists, school notes, school lunch planners, and more! 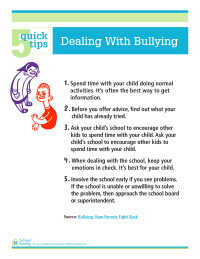 Are you worried your child is being bullied? Here is information to help you communicate with your child and to get the help you need from his school. 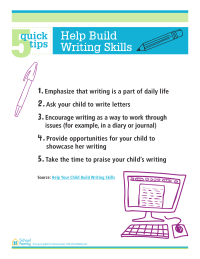 Does your child have writer's block? Or could she just use a boost? Use this printable sheet of 5 quick tips for inspiration. 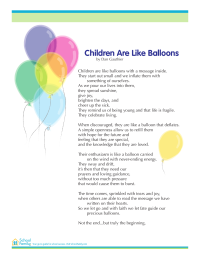 Print this sweet and inspiring poem about childhood for back-to-school gatherings (like boohoo/yahoo kindergarten events) or other occasions. Have fun being creative with your young child as you help her paint one palm and thumb with brown paint, and then the other four fingers with different color paints, to make a turkey. After the paint dries, have her use crayons to add features like eyes, beak, wattle, and feet. Middle school is a time of transition for kids and parents alike. 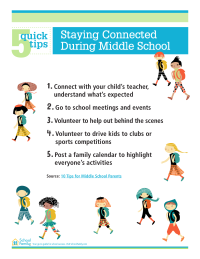 Here are 5 quick tips on staying connected and involved with your child's middle school experience.